Three women climb the stairs of a beautiful Victorian in San Francisco. They hold nothing in their hands, but they bring a precious gift. These women are members of the Threshold Choir, and the home they are visiting is the Zen Hospice Project. They sing to people at the last threshold of life, and today, when they reach the second floor, they find Luca Sager, a 38-year-old chef with terminal brain cancer. Kate Munger founded the Threshold Choir in Marin County and the East Bay 16 years ago. She says it grew out of her own experience of sitting with a friend of who was dying of AIDS back in the '90s. The Threshold Choir has spread since then -- across North America and to other countries. It is devoted to lifting others up, to creating a place for reflection, especially for people who may be outside the traditional reaches of religion. The singers speak of the healing quality of music and the power of the human voice to soothe and to make beautiful the process of dying, which is so often accompanied by great fear. Choir singer Katharine Rose Kirner says she knows what it is like to lie powerless in bed facing the fear of death. In 2001, as the country was reeling from the 9/11 attacks, Kirner faced a different kind of threat, a brain tumor the size of a grapefruit. She says she was gripped by fear of death and feelings she had not done what she needed to do in her life. She vowed to do something “important” if she recuperated. When she did eventually heal, she learned of the Threshold Choir and became a devoted member singing at least once a week. She says being part of the choir has given her a chance to see how gentle dying can be. 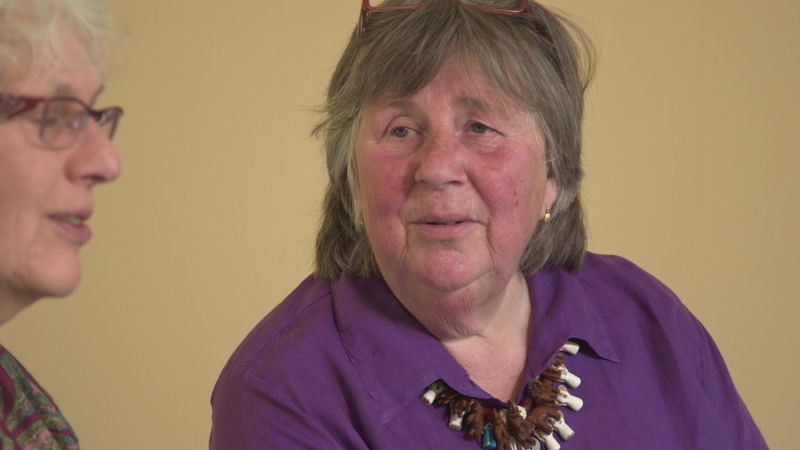 Singer Peggy Cadbury, a retired nurse, saw a fair amount of death while working in hospital settings. But as a member of the choir, she has the chance to tend to the dying with a different intention. Cadbury says singing quietly and softly the simple songs written by choir members is much like singing a lullaby to a child. “It is like a gentle caress, and it feels right,” she says. 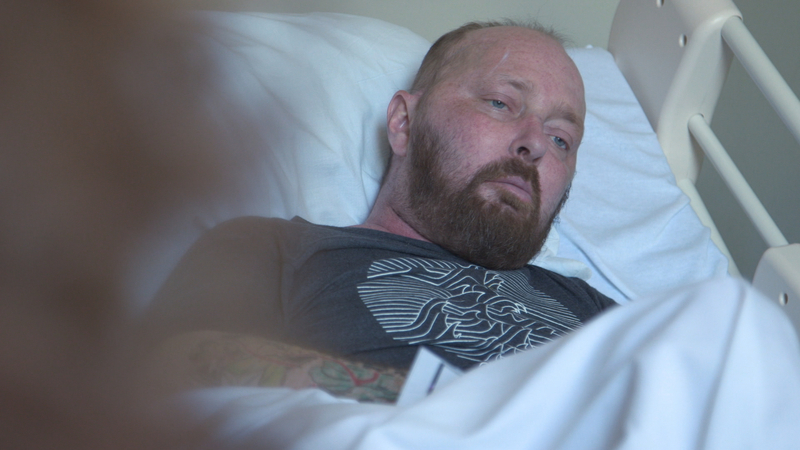 Sager, the patient, says the singing not only helps bring him emotional calm, but it also reduces the physical pain he has in his head around the tumor. Research suggests that listening to live music can help reduce pain in palliative care patients. A 2012 study found that patients found that patients who had the harp played to them for 20 minutes -- along with breathing exercises and visualization -- reported a significant decrease in pain compared to a control group. Registered nurse and certified music therapist Kathy Jo Gutgsell at University Hospitals in Cleveland was lead author of the study. She believes music “may awaken the body’s own endorphins" -- those much-chased-after chemicals that make us feel better about the world. The Threshold Choir singers say they, too, are helped by the act of singing together and for a person in need. “You see them calm, and then you calm, and it’s a reciprocal thing,” Cadbury says. Kirner says singing in the choir is one of the best things in her life. “I get a sense of purpose.” Choir singers may benefit in other ways. A growing body of research finds that people who take part in choral singing have a better sense of wellbeing than those who don’t sing. The research suggests that singing itself can raise levels of oxytocin, the hormone associated with trust and bonding. So people who sing in chorus may feel a strong bond with those they sing with together. 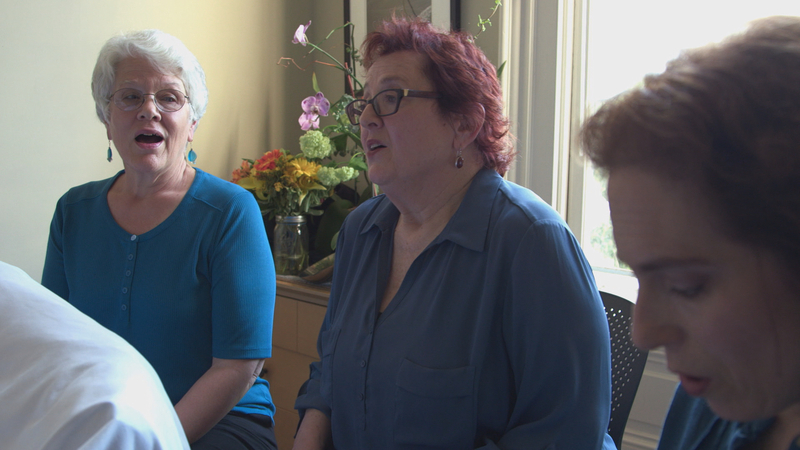 Right now in San Francisco, a five-year study is underway looking at both the possible physical and emotional benefits of choral singing for seniors. Sager, the patient, says he believes as human beings our purpose in life is to be givers however we can. He says he did that as a chef, serving homemade nourishing food. He says he is proud of the Threshold Choir for offering their songs as a gift, “to receive that gift is an act of love and support, an act of care, which is what I need most in my life right now."